Many people like using iCal calendar applications on their iPhone, this is to keep them organized and remind them where they are supposed to be at a certain day and time. You may want to sync your iPhone with iCal calendar on a Mac which is very simple. Calendars are important and having one that you are using and updating for the coming events will be of great help for you. First launch your iTunes applications by clicking on the iTunes in the dock on of your Mac. Use your iPhone USB cable to connect iPhone port on your Mac. On the left side of the iTunes window, there is ‘Device’ option, click on icon of your iPhone on it. On the top of the iTunes window tab, select Info. Put check mark in the ‘sync iCal calendar on check box. Disconnect the device from your Mac and the process will be over. Remember with Google calendar you can be able to view and edit from your iCal on Mac and also from your iPhone. You can also permit your friends or working partner to edit especially if it is an office calendar and you are the one who is in charge. People have embraced use of calendars instead of walking with diaries that they write their appointments or events. This is the easiest way and if you have an iPhone, you nee to download and install this important application. If you have an iPhone and iCal take advantage of the calendar apps before they become like those diaries we used to carry some years back. This is because the technology is moving very first and at anytime you can hear they have other things. Take advantage of it at this moment. If you don’t have a calendar, creating it is very easy and it will cost you nothing. I mean you don’t need dollars to open one with Google especially if you have a Gmail account. Stop being a kind of a person who keeps on asking, when is the meeting or when is the event taking place. In fact they can nickname you as ‘a bother’. It is ridiculous but it can be yours for the asking. 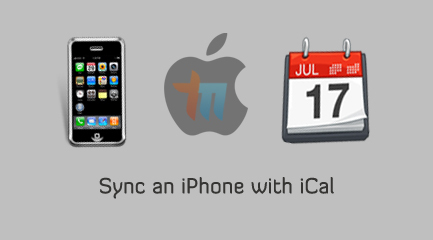 So Sync an iPhone with iCal on your mac easily.